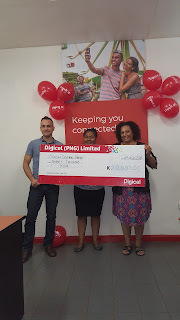 Digicel extends its warmest congratulations to the organisers of the Goroka Show and the people of Goroka as they prepare to celebrate the 60th Goroka Show this September. Digicel is supporting this world renowned event by providing a K20,000 cash sponsorship. Digicel PNG Managing Director Mobile, Shivan Bhargava said the show is an occasion that locals and international visitors alike should try to experience at least once in their lifetime. “The Goroka Show is a truly unique experience–providing a rare opportunity to witness the diverse customs and traditions of the diverse tribes that populate the highlands. “There are very few places in the world where you can see thousands of painted warriors performing traditional songs, dances and rituals right before your eyes. Established 60 years ago by Australian Patrol officers, the Goroka Show started out as a local get-together where tribes from across the highlands would gather to showcase their unique cultures and forget their tribal differences for one week-end every year. This extraordinary scenario became hugely popular and over time grew into a major tourist event with thousands of attendees every year. “The people of Goroka and the highlands should be proud of the extraordinary tradition and legacy this event has created for future generations of Papua New Guineans,” Mr Bhargava said. Show Chair Lady, Keryn Hargreaves, has welcomed the sponsorship on behalf of the Goroka Show. “I want to thank Digicel for their K20,000 sponsorship,” she said. Held annually on the week-end closest to Papua New Guinea’s national Independence Day, this year’s event will run from 16 – 18 September. The town of Goroka is the capital of the Eastern Highlands province and has a population of 25,000. More exposed to European influence than any other highlands province, the area has a colourful history in gold mining and coffee plantations. Goroka has become a major tourist attraction in Papua New Guinea because of the show which is today internationally renowned. The 2016 Goroka Show is set to be a spectacular cultural event with fireworks and fun activities for the whole family.